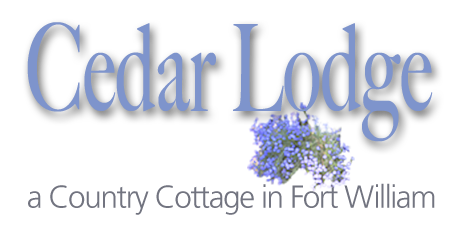 Cedar Lodge bedroom accommodation provides two tastefully decorated rooms. The master, ground-floor bedroom, has a large ensuite bathroom/shower/toilet with mirror-clad sliding doors revealing enormous storage space for clothing and luggage. This room has a king-size bed and a single bed to accommodate up to 3 adults. HD TV/DVD is installed. The upstairs bedroom can be provided as either a large king-size bed or two single beds and has ensuite shower/toilet. Basically, these two bedrooms provide comfortable accommodation for up to 5 persons. The ground floor room layout may be suitable for a family of 3. We can provide a cot for an infant. The view from the windows overlook the garden deck and beyond to Ben Nevis and surrounding mountains. The morning light is often stunning. All bedding and towels are provided for you. Wake up refreshed and ready to start a new day exploring the West Highlands of Scotland.